massive movements and groundbreaking historic events have been the causes and consequences of these ideologies. a magnificent volume that reads like an epic saga of the best and the worst of humanity over the last two hundred years. "The Philosophic Roots' abiding merit is that it is not condescending to the reader. This is so important. The reader has a genuine sense that he or she is being respected as an intellect by the authors. Given the complexity of the subject matter, not to mention the erudition of the authors, achieving this feat is no small task." This brand new and fully updated edition builds upon over three decades of research, thought, conversation, and teaching of the most powerful political ideologies of our era. 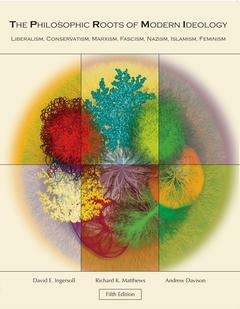 The Fifth Edition expands the treatment with a completely new chapter on Feminism, and provides significantly updated treatments of each ideology and new discussions of conservatism, neoconservativism, imperialism, Islamism, modernity, colonialism, and globalization. It is extremely up to date, with a new section in the Fascism chapter covering the rhetoric of Donald Trump during the 2016 primary election. It contextualizes and explains the ideological foundations of the American war on terrorism and ongoing developments in nation states where pivotal ideological developments are occurring, especially the United States, China, and Iran. The authors also offer fully updated introductory and concluding chapters on the ongoing significance of studying ideologies and their meaning in a new global era. What makes The Philosophic Roots an excellent textbook is that it emerges out of vast teaching experience that the authors have in a variety of university and college contexts. Each chapter is written in a way that invites readers at all levels into a classroom dialogue about the vision of humanity offered by each ideology and the kind of political world each ideology seeks to create. In these ways, The Philosophic Roots is an effective learning source for both those with little knowledge about the content of each ideology and those with prior knowledge seeking to think even more about the meaning and political significance of each belief system.